CVS Health has a longstanding commitment to help communities address and prevent drug abuse through education, outreach and safe medication disposal. CVS Health has teamed up with the Partnership for Drug-Free Kids to launch the Medication Disposal for Safer Communities Program, which has donated more than 500 drug disposal units to police departments around the country. The program gives members of the community a safe and environmentally friendly way to dispose of unwanted medication and has already collected more than 28 metric tons of prescription drugs across the U.S. The Tell City Police Departments partners with the Perry County Solid Waste and the Drug Enforcement Administration each April to conduct a county wide collection event. 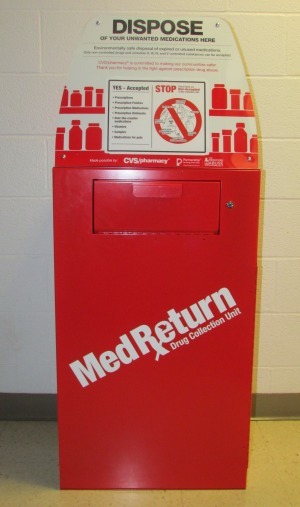 Where can you drop off your medications? The Tell City Police Department houses a receptacle in the lobby of its police department. This is accessible to the public 24 hours a day and seven days of a week. We accept all varieties of over the counter and prescription pills for human and or pet consumption. We do not accept liquids or hypodermic needles.